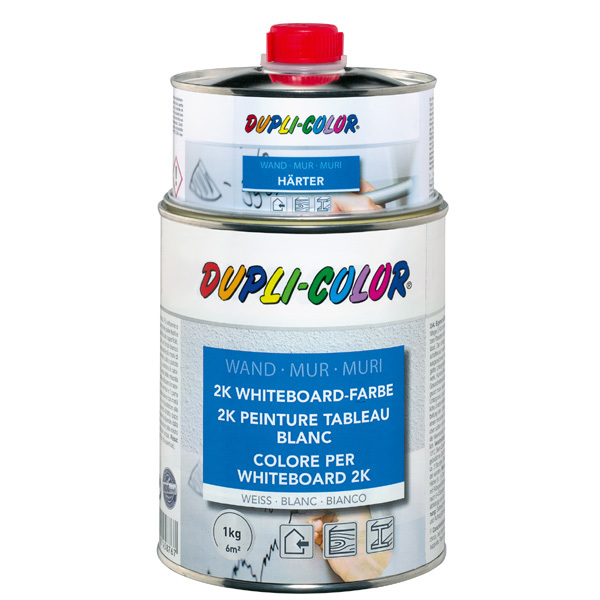 DUPLI-COLOR Whiteboard Paint is a high gloss, water-thinnable and hard-wearing 2-component paint on basis of polyacrylate, using a chemical interlacing with a special aliphatic isocyanate hardener. Transform every smooth surface into a surface you can write on with whiteboard marker, which can be wiped off dry, whether it is a big wall, a door, a cabinet or an old blackboard. Suitable on all smooth grounds, such as wood, metal, masonry, hard plastics, earthenware etc. For example in living rooms, class rooms, offices, heath facilities, conference rooms and so on. The drying time depends on surrounding layer thickness, temperature, air humidity and absorpitivity of the ground. 12 months if appropriate storage provided (=10°-25°C, relative air humidity of max. 60%) in the unopened original container. The ground has to be clean, dry, fat-free and above all it must be smooth. The smoother the ground, the better texts and drawings can be removed from the painted area. Irregularities will be visible after application, therefore remove dust and irregularities before application. Wipe dry with a cloth. Untreated and dark surfaces should be primed with a white primer. That avoids the application of several coats of the Whiteboard Lacquer. Do not work during temperatures below 10°C. Please take care, that the component A + B are properly mixed. The potlife and working time is approx. 2-3 hours. Do not work with thickening material. Apply a rich and even layer of Whiteboard paint. The product is ready to use for brush application and application per roller. For spraying (airless) the viscosity has to be adjusted. Dilute in little steps, as already small quantities if water cause a high degree of dilution. 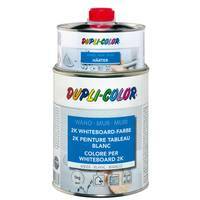 Persistent remainders of markers can be removed with as special cleaning spray for whiteboards.